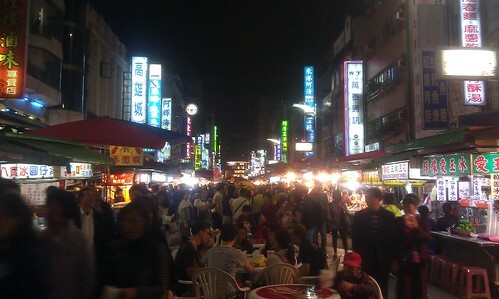 They say a visit to Taiwan is never complete until you have been to their famous night market (夜市). 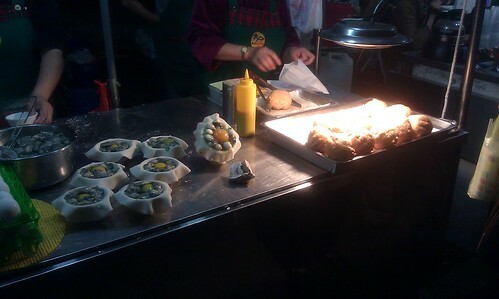 A typical night market comprises of 3 sections. The first is definitely food, glorious street food! The second is the gaming section where you have simple carnival types of games like shooting hoops, darts, air pistols, pachinko and my all time favourite, paper net goldfishing. Last but not least, a retail section selling anything and everything from shoes to clothes to knick knacks at very attractive low prices. However, due to the growing popularity amongst the tourist, we have more and more night market catering to the tourist and thus featuring only street food. LiuHe Night Market (六合夜市) is one such night market featuring only street food. Here's the background story. My second aunt is a retired teacher after having taught at a local school nearby for over thirty years. 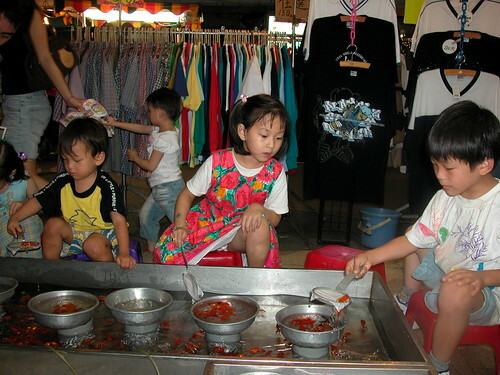 For someone who has been teaching for such a long time, it is not unusual to have parents and kids taught by the same teacher and it just so happened that many hawkers there and their kids were once student of my aunt. My aunt loves this night market as she is always happy to see familiar faces as they were to see her. The only problem is that these stall owners never accepted her payment for all the foods which makes it awkward for her to come often for it may appear that she is there to free load off them. So without further ado, let go whack the foods! First stop was a restaurant about a stone's throw away from the night market. As one would have guessed, it belonged to one of her ex-students as well. We stopped by for a light dinner but I chose to save my appetite for the good night market fare. 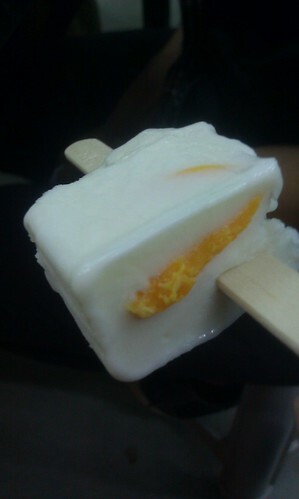 However, one item caught my eye and it was the Milk and Salted Egg ice cream. Salted egg ice cream?? As it turned out, it tasted like a typical snow skin moon cake with salted eggs yolk inside, except frozen. I also took a bite of a Milk and Glutinous Rice Cake ice cream. That was sooooo wrong. Here is one thing that got my attention. Initially I thought they were curry pok, given my weakness for these heavenly delights. Upon closer look, I realise there were something else. They were oyster puffs! First they get a bowl and lined the puff pastry skin inside, then they loaded it up with oysters and top it off with an egg in the middle, before wrapping it up and dunking it into the deep fryer. I chickened out from this as I thought that was oyster overkill for me. * Click to see the Oyster Puffs in greater detail. In all, it was a fabulous gourmet treat but I was disappointed not to find the push-cart hawker beef steak stall. For NTD 199 (about SGD 8.50) you get a three-course steak dinner of cream of corn soup, a T-bone or sirloin steak (your choice) on a hotplate and a cup of black tea. It used to be NTD 99 (about SGD 4.20) when I was a kid but alas with inflation over a 30-year span, it is now NTD 199 but still relatively cheap nevertheless. My fondest memory of this steam is how they use a pair of pliers (the ones you normally find in a toolbox) to serve you the hotplate. I like it for the generic and rusty charm of it all. No fancy smancy presentation when all you need is a pair of pliers to do the job.